Sometimes it's not so much about the product; but where the product can take you. Where to? Tea giant Celestial Seasonings wanted to invite us all on a trip with their green tea packaging. A retreat to an abundant estate in an exotic region of China where tea is grown in lush green hills. Only one problem – the location they were imagining didn't exist. Enter artist Michael Bast and his plan to bring us there (without the 15-hour plane ride). Creating a realistic fictional location. For Michael, step one is collecting and studying hundreds of photographic images of estates and specific geographical locations. Then he uses these photos as inspiration as he starts to sketch out an idealized vision of the pristine plantation. "The filter is your interpretation of the scene. Your eyes and brain coupled with the ergonomic physicality of your arms and hands all play a part in the result" explains Michael. Final destination. Michael shares with us some of the original sketches, photo compositions, and final details for the packaging. He creates all of his paintings in Corel Painter and has been for the past 25 years. 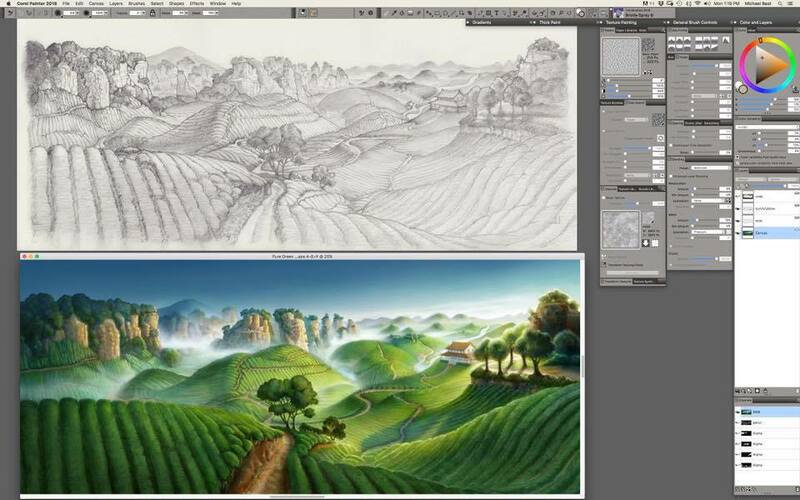 Michael credits the program as "simply the best choice for digital painting." When we as consumers associate a product with the place it comes from, it sparks a connection in us. We want to be a part of it. A smart campaign and a successful partnership between Celestial Seasonings and Michael Bast brings us so close to this dreamy estate, we can quite literally taste it.